#71 Spanish Classical Brazilian Rosewood/Engelmann Spruce top. This is an exceptional guitar. French polish top, lacquer back and sides. I would enjoy comparing the performance of this guitar to any guitar valued much higher. Scale is 650mm and very easy action. The videos with links shown on this page are not sound-enhanced. Includes Humicase with personalized wood identification label (see pic). This guitar was built for the “La Guitarra” festival in San Luis Obispo. 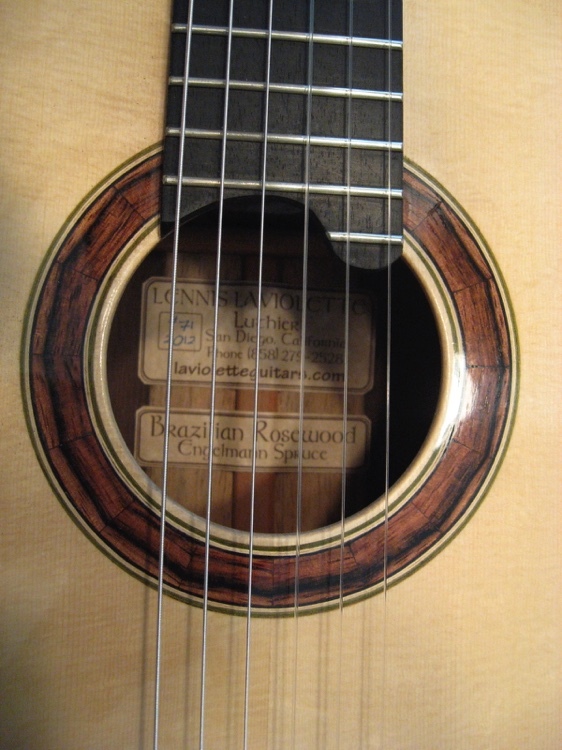 The links beside this text will take you to 2 videos of 2 exceptional guitarists who reviewed this guitar. Both told me that this is the best classical guitar they have ever played.